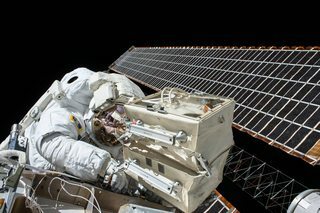 My understanding is that the ISS's solar panels are silicon and double sided to maximize bang-for-the-pound (average power per kilogram transported to orbit). 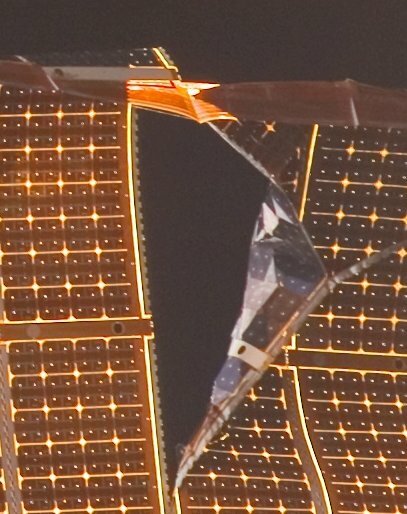 See Are the ISS US Segment solar arrays double-sided? and the image there, and Why does the ISS not use the most efficient solar panels available? and associated images and answers. But I don't understand the appearance of this panel in the photo below. I'm assuming the dark stuff is silicon, but there are a lot of silver/gray dots and for every four of those there is a larger interstitial red dot. And the whole think looks flexible as if it were a film rather than a crystal. What is the structure of these devices? Are they made from amorphous flexible films of silicon, or lots of small little thin crystals of silicon on a flexible matrix of some kind? How does sunlight reach both sides - does it pass through a backing on one side? below: original image shown in reduced size. (right) click for full size. The cells themselves are not flexible -- indeed, they are fairly thin and delicate (I should know, I've broken quite a few of them myself). The flexibility you see comes from the fact that the cells are individually welded and glued to a very thin, flexible blanket made from Kapton, silicone, and fiberglass. 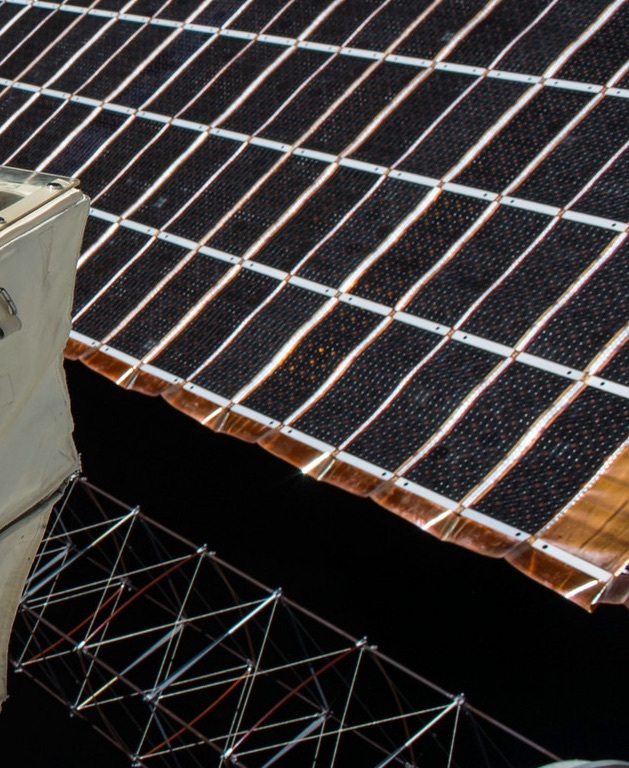 I can't find a public datasheet for the solar cells (if I find one, I'll edit the post), but I can do my best to describe what you're seeing, with the help of this image I found online (rehosted from http://pages.erau.edu/~ericksol/courses/sp300/images/iss_cells.jpg). The inset image on the lower right is a closeup of the back side of a single cell as seen through the blanket substrate. As you can see, the four dots are "wrapthrough" connections that take the collector grid from the front face and feed it to a set of contacts on the back face. 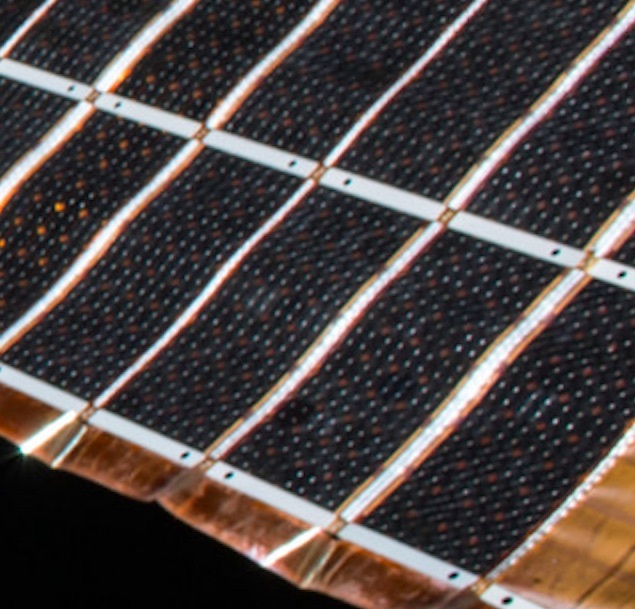 The ISS solar cells are a little bit unconventional in that rather than having the interconnect contacts on opposite edges of the cells, all of the contacts are on the back face of the cell. Those dots are actually silver-plated holes in the silicon cell, much like a via in a printed circuit board. Those holes are covered by the coverglass, which is a thin sheet of glass with UV-blocking and anti-reflective coatings that protect the exposed face of the cell. The interstitial red dots you see are actually the blanket material behind the cells. The cells are shaped like squares with the corners lopped off, so the dots are actually where the missing corners of four adjacent cells come together. You can see this somewhat in the image, though the edges of the cell are obscured by the copper traces on the blanket layup. Sunlight (when the back of the blanket faces the sun -- earth albedo light otherwise) reaches the back of the cell by nature of the fact that the blanket material is largely transparent, which is plainly apparent in the image. The orange color is due to the Kapton on the blanket. The back face of an ISS solar cell is actually green. Side note, the numbers you see printed on the cell are the lot number (on top) and the grade number (on bottom). The cell depicted is on an engineering test article (hence the extra wiring for what appears to be thermocouples) and is not a flight-grade article, but the physical appearance is identical. Not the answer you're looking for? 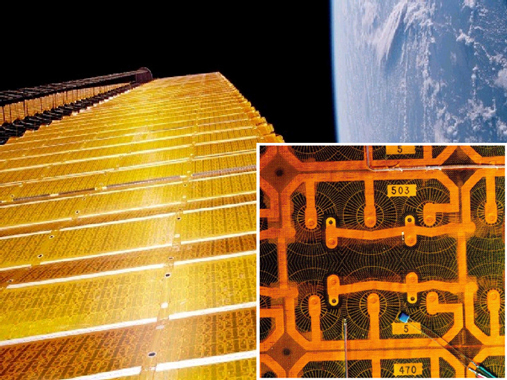 Browse other questions tagged iss solar-power flexible-solar-panels or ask your own question.